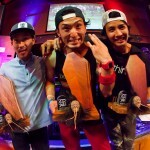 Japanese riders take New Orleans by storm and walk away with the top three spots. 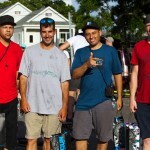 The seventh installment of the premiere flatland event in the U.S. went down this past Saturday in New Orleans. The Flatland Voodoo jam is organized by Louisiana natives Scott O’Brien and Terry Adams, and with 34 pro riders representing 11 countries; this year’s competition was no doubt the best yet. The weekend-long celebration of friendships and BMX kicked off on Friday afternoon with the official pre-jam at a local community park where Jeremy Jones won the veteran class competition. The surrounding residents were in shock as hundreds of riders infiltrated their unsuspecting neighborhood and overtook the park for an amazing afternoon of riding and catching up with old and new friends from around the world. Saturday’s events started off early in the morning with nearly 40 amateur riders competing for top honors. After each of the 10 finalists completed their two minute run Patrick Ras out of Czech Republic walked away victorious with the U.S.’ Steve Jordan and Todd Carter coming in second and third, respectively. 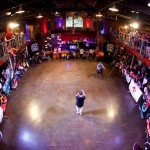 Once the pro contest began, it was an all out brawl to see who would make it into the 14-man elimination style final battles. Everyone in the pro class knew they had to throw down near-flawless runs filled with their most difficult tricks if they had any chance of cracking into the top few spots. 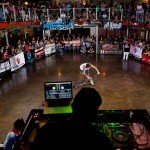 The energy of the roaring crowd inside the packed nightclub fueled the riders as the battles ensued. One by one riders were taken out of the equation until only two riders remained. The final battle to see who would be crowned the Voodoo Jam champion pitted Tsutomu Kitayama against his fellow countryman Hiroya Morisaki in an epic fight to the finish. The fans were on their toes as the two went back and forth, pulling their most difficult links. As the final seconds on the clock counted down, pro riders were jumping around on the contest floor cheering them on as they landed their last combos. When the winner was announced, it was Tsutomu who climbed on top of the podium as Hiroya stood beside him in the second place spot and their fellow Japanese comrade Yohei Uchino took to the remaining pedestal. 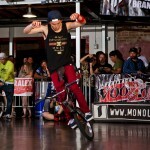 The 2013 Flatland Voodoo Jam is proudly sponsored by: Red Bull, Dan’s Comp, Freegun Underwear, Headrush, Odyssey, Deco, The Byke Project, Flatland Fuel, Diversion TV, Monolithic, #Pralex, Aspire To Inspire Clothing, and Neue Creative. 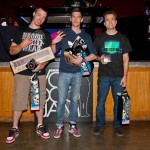 Voodoo Jam Veteran Contest winners. Photos by @FatTonyBMX, courtesy of Flatland Voodoo Jam.